The clubrooms in the Town Hall commemorate those who served in World War One. The Governor General Lord Forster, laid the foundation stone on the 6 October 1923. Forming portion of the Glenelg Town Hall buildings, the club rooms of the Returned Soldiers and Sailors' League were officially opened on the 22nd November 1924 by Mrs. J. Heithersay, whose four sons enlisted in the war. After she had performed the ceremony, Mrs Heithersay was presented with a silver key of the club. 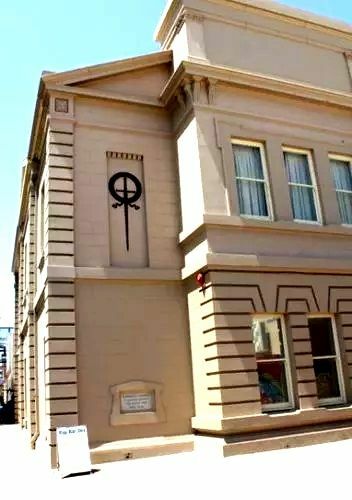 The function was attended by a large crowd, among which were members of the executive of the South Australian branch of the Returned Sailors and Soldiers' League. In 1918 a committee was appointed to consider the question of a memorial. 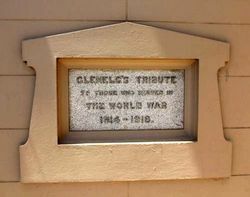 The decision to adopt the scheme was reached after the Returned Soldiers' League at Glenelg had expressed a desire that the clubrooms be attached to the civic home of the town, in preference to its erection in any part of the suburb. The scheme was launched in 1921 when an appeal was made to the people of Glenelg for the purpose of raising £5,000. The cost of the clubrooms with the furniture had been £1,450. The corporation had raised by loan the estimated cost of the whole building. He desired to thank Mr. G. K. Soward, who had given his services as architect to the Soldiers' Club gratuitously.